Dumore Grinding Wheels for Tool Post Grinders are available in four different types for grinding the various materials encountered in the majority of grinding applications. 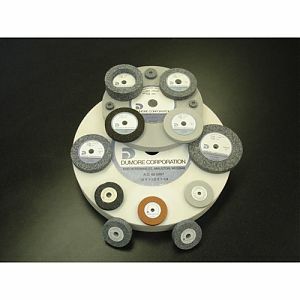 Unless otherwise noted Dumore grinding wheels are made of Aluminum Oxide (A/O). Grinding wheels made of Silicon Carbide (S/C) are noted in the chart below. Note: 774-0051 has a limited quantity and will be discontinued when present stock is depleted. • For Cast iron, brass and other Non-Ferros Metals.